Use action buttons to cue or launch an action in your presentation, such as go to the next or a specific slide, run a program or play a video clip. Pick an action button from the Shapes gallery, and then assign an action to occur when you click the shape or point the mouse at the shape. Go to the next slide, the previous slide, the first slide, the last slide, the most recent slide viewed, a specific slide number, a different PowerPoint presentation, or a Web page. Some examples of built-in action button shapes that you can find in the Shapes gallery include right and left arrows, commonly understood symbols for going to next, previous, first, and last slides, for playing videos or sound bites, and more. Tip: Action buttons provide great visual cues to the action it launches, but you can also assign actions to other objects, such as pictures, general shapes, or to the text in a SmartArt graphic. Use the procedure below to add an action to those objects as well. On the Insert tab, in the Illustrations group, click Shapes, and then under Action Buttons, click the button shape that you want to add. Click a location on the slide, and then drag to draw the shape for the button. To choose the behavior of the action button when you click it in Slide Show view, click the Mouse Click tab. To choose the behavior of the action button when you move the pointer over it in Slide Show view, click the Mouse Over tab. If you want the action to occur when the action button is clicked, do the following steps on the Mouse Click tab of the dialog box. If you want the action to occur when the action button is simply pointed at, do the following steps on the Mouse Over tab of the dialog box. 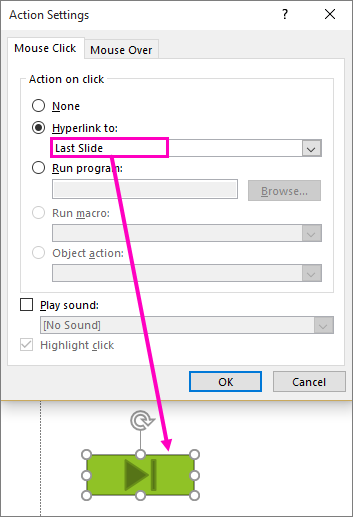 Choose Hyperlink to and then select the destination (for example, the next slide, the previous slide, the last slide, or another PowerPoint presentation) that you want the hyperlink action to go to. Note: To link to a file created by another program, such as a Word or Excel file, in the Hyperlink to list, click Other File. Choose None to use the shape without a corresponding action. Choose Run program, then click Browse to locate the program that you want to run. Choose Run macro and then select the macro that you want to run. Note: The Run macro settings are available only if your presentation contains a macro, and when you save the presentation, you must save it as a PowerPoint Macro-enabled Show. For more information about macros, see Run a macro. If you want the shape that you chose as an action button to perform an action, click Object action, and then select the action that you want it to perform. Note: The Object action settings are available only if your presentation contains an OLE object. To play a sound, select the Play sound check box, and then select the sound that you want to play. When you've finished choosing your action, pick OK. Note: If the macro doesn't run, make sure PowerPoint is enabled to run macros. For more information, see Enable or disable macros in Office files.